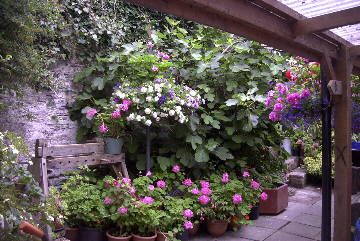 Old Time is a 15th century house and shop in the centre of Bishop's Castle, a small medieval market town in the unspoilt country of the Shropshire Hills surrounded by an Area of Outstanding Natural Beauty. 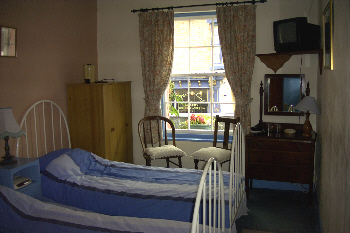 We have two double rooms and one twin bedded room, all en-suite, which offer comfortable, bed and breakfast in the heart of this small, thriving market town circled by quiet, beautiful hill country for walking, cycling and exploring. 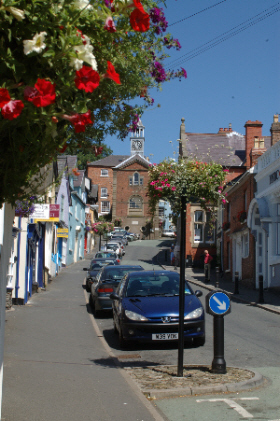 The town, only a few miles from the Welsh border, has two excellent breweries, six pubs, good restaurants, lots of interesting shops and two museums as well as offering town tours on Tuesday and Saturday evenings. 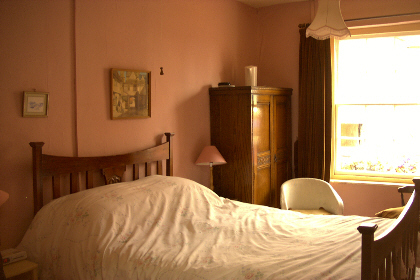 Bishop's Castle is a "Walkers are Welcome Town"
The pink bedroom is the largest room and it has a small balcony overlooking the main street. 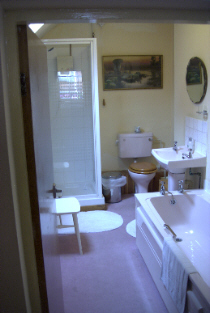 The pink bedroom has an en-suite bathroom with bath and shower. 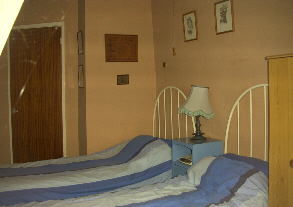 The Blue bedroom has twin beds and overlooks the main street. 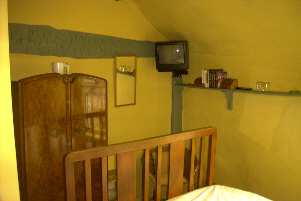 The cruck room is a double bedded en-suite room in the oldest part of the house overlooking a neighbouring court yard and the hills beyond. 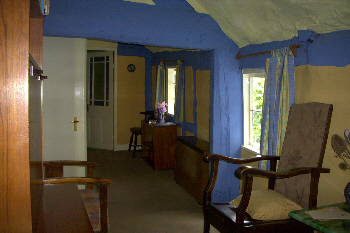 Many beams criss-cross the walls of this room which has a large sash window giving lots of light. 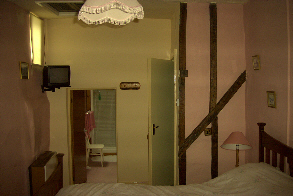 The cruck beam across the landing. 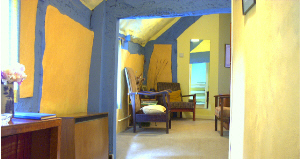 All the rooms go off the wide landing which guest are welcome to use as a lounge. There are several comfortable chairs and a coffee table. 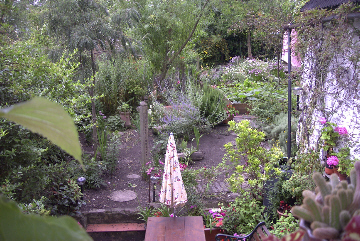 >French windows from the dining area where guests eat breakfast opens onto the garden of Old Time. The adjacent kitchen looks out on to the courtyard. 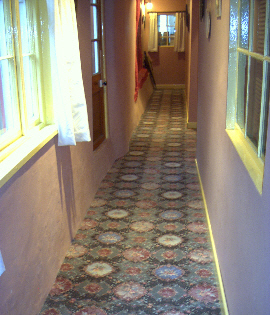 The hall, to the right of the shop, leads to the rest of the house. 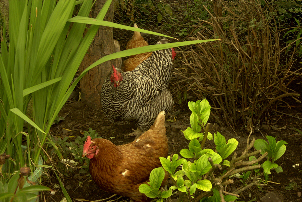 Hens in the garden produce free range eggs for the breakfast table. Wholemeal, malted grain and white breads are home made with flour from Bacheldre Watermill,a waternmill nearby over the Welsh border. Marmalades - Seville orange, three fruit and lemon, lime and ginger - are homemade. Milk is organic and bacon and sausage is from Neuadd's Baconry at Llandinam who are regular stall holders at Bishop's Castle Farmer's Market on the third Saturday of every month. 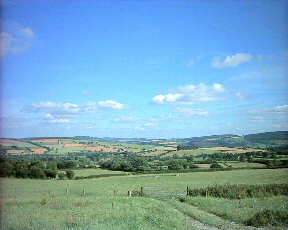 Pictures taken by Nigel Bishop. 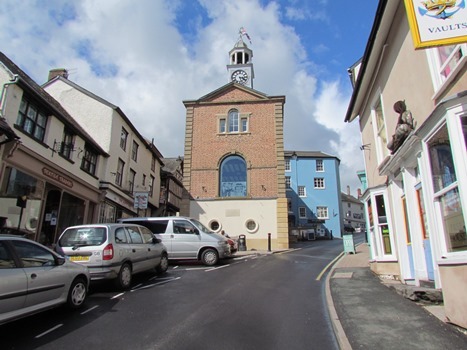 There are no parking restrictions in the town; the car parks and on-street parking are free and coaches are welcome. 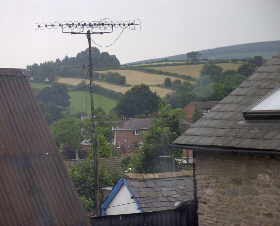 The nearest train station is at Craven Arms but transport links are difficult. The visitor using public transport is advised to use Shrewsbury Station and use the regular bvus service from Shrewsbury to Bishop's Castle. The buses run three times a day each way every day except Sundays and Bank Holidays. 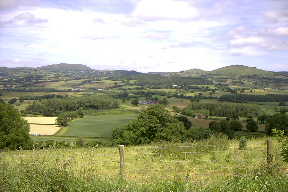 rolling upland which surrounds Bishop's Castle. 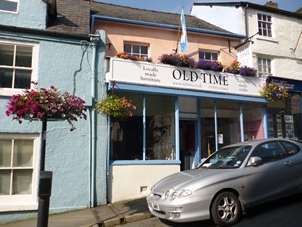 Old Time is a Grade 11 listed 15th century building and is unsuitable for guests who are unable to manage stairs. There are low beams on the landing and in the dining area and steep step down to the bathroom in the pink bedroom. If you have any specific requests or questions that you would like to discuss with us, please call or email. 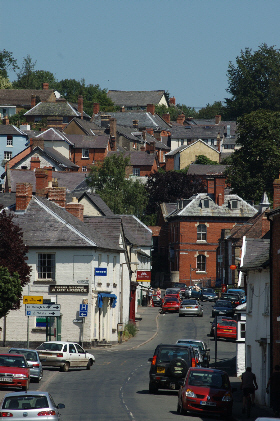 Old Time is a member of the Shropshire Hills Sustainable Business Scheme – a new scheme designed to encourage businesses which trade in a sustainable way and encourage them to do even more! Old Time is off the main A488 Shrewsbury to Knighton road. Turn into Bishop's Castle and find us halfway up the hill opposite Barclay's Bank. Return to our HOME PAGE to find out about OLD TIME CHAIRS and OLD TIME FURNITURE . 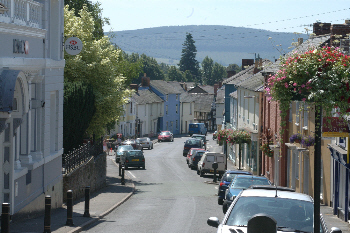 More information about the TOWN, its beer and festivals and the surrounding area.